4 more day still till the actual date (September 22). There is no doubt about it, that pumpkin tastes better in the fall. Do you know why this is? That is because it is fresh and the nutrients are overflowing! When a food is in season, the nutrients are higher. That explains why food always looks brighter and plumper in season. To savor this special food, preserving it is the best way to go! I do not like to buy canned pumpkin throughout the year because 1. it is not GAPS legal 2. Cans leach bad stuff 3. and it just tastes well..dull. Here is my favorite way to preserve pumpkin and squash. I think I buy about 1/2 pumpkin and 1/2 butternut squash (so good and creamy!). They are very similar, but pumpkin tastes a little more “pumpkiny” and the butternut squash turns out little creamier and lighter colored. The recipe below can be used to cook either pumpkin or butternut squash (these are the only two squashes I have tried this recipe with). What about the rind and the seeds? Pumpkin seeds (recipe below) are absolute amazing and chock-full of magnesium! Squash seeds turn out a little drier but still good! You can also season them in a million different ways (cinnamon, chili, onion…). Sometimes I blend the rinds of pumpkin and squash. I always believed that there is some nutritional value in the bright orange rind too. (If you are on GAPS intro, do not blend the rind because it can be too high in fiber). I don’t think the taste is not much different. Though, I would only suggest using the skin if your squash is organic. If not, just scoop out the creamy orange pumpkin/squash from its rind. Is you are going to start GAPS or are on GAPS, pumpkin and squash can be a life saver (especially during intro). It is filling, satisfying and helps to keep you from going too low carb! Try my GAPS pancakes! Now is the time to store up on this wonderful fall specialty, because you cannot buy the canned stuff on GAPS! Preparing squash and pumpkin is super easy and you will be so happy you have it done, next time you need food! If you are planning on starting GAPS read this book, its super helpful and full of very yummy recipes! To keep enough pumpkin around for the whole year I usually have to cook and puree several pumpkins. I tried dehydrating pumpkin, but I am still working on the recipe. I don’t like to buy pumpkin fresh in the summer or winter or spring, it’s just not as good. I just bought a chest freezer, so I am super excited to finally have enough room to stock up on pumpkin for the year! I puree the pumpkin and them pour it in an ice-cube tray. Once it is frozen I store the cubes in a plastic bag. 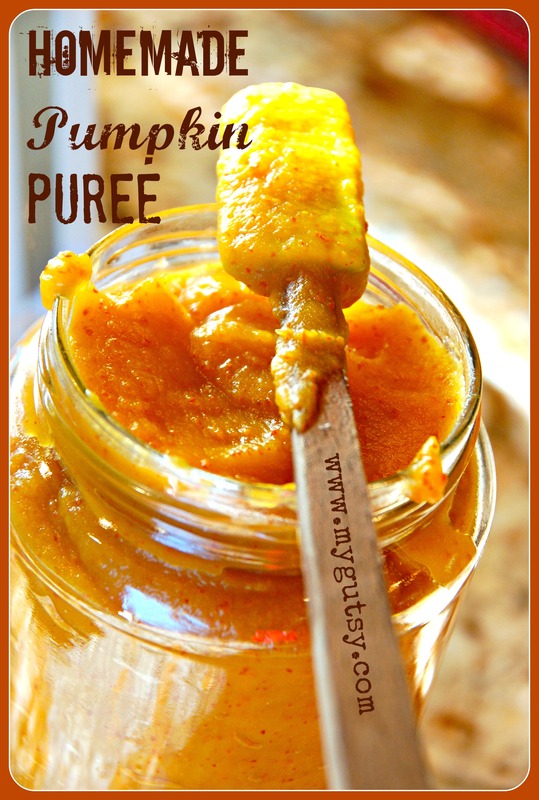 Maybe I will try to can the pumpkin puree too…ohh just so many things I could do. For now here is my super simple recipe! *use this recipe for either pumpkin or squash. (pumpkin will yield more seeds). 1. Wash the outside of your pumpkin or squash. 2. Cut off the stem, chop in half (be careful! ), and scrape out the seeds (save to roast, recipe below). 4. Put pumpkin halves face down on a cookie sheet and bake for 60-90 minutes (depending on size of pumpkin). The outside should be a nice deep orange and soft to the touch. 5. Let it cool down for 20+ minutes (so you don’t burn yourself!). Roughly cut up pumpkin in wedges that will fit in your blender/Cuisinart or scoop out the pumpkin meat from the shell. (I just blended the rind and all because my pumpkin was organic). 6. Blend the pumpkin (do it in batches so you don’t overwork your blender or Cuisinart). I had to add a few Tbsp of water to each batch of pumpkin to “get it moving” through the blender. 7. DONE! Now you have nice smooth pumpkin puree. This stuff is the “real deal”- not from a can! Store in a glass ball jar in the fridge for 1 week. Or freeze in ice-cube trays for long-term storage. 1. Scoop out homemade pumpkin puree (recipe above) into an ice-cube tray. 2. Freeze for 8 hours or overnight. 3. Run hot water over bottom of ice-cube tray to release pumpkin cubes. *To defrost: take out how-ever-many cubes you want and place them a glass jar overnight (8 hours). Separation of the pumpkin is normal. Just blend the defrosted cubes to form the original smooth consistency. 1. Scrape out seeds from pumpkin and toss the “goop + seeds” into a bowl. 2. Fill bowl up with cool water. 3. The seeds will tend to float to the top to make the “sorting” easier. 4. Swish and rub the seeds around with your hands to release the pumpkin “goop” from the seeds. 5. Toss the “goop away”. 7. Roast the seeds on a cookie sheet with coconut oil or palm oil and sea salt in the oven (350) for 15 minutes or until golden brown. Give them a quick toss in the middle of baking. Or use this recipe. I have never cooked a pumpkin, but it is on my bucket list! I’m going to try this when I can find a baking pumpkin! LOL, we have to do this if we want pureed pumpkin down here in Australia. You can’t actually buy the canned stuff here! Oh I wish that was like it here. Canned stuff is just non good, you are not missing out! What a perfect post! And I love your graphics 🙂 If you do a guest posting in October on Canned, could you use this one? I love it!!! Great job and great information Caroline. Sure! Thanks so much! I love playing around with picmonkey to make my pictures pretty! I’ve found that I can keep pumpkins and other squash for months in my garage when it starts to get cool outside. Do you live in a place where the nights are getting cooler? Try keeping them whole if you’re running out of freezer space – when I see that one of them has a soft spot or something, I roast, puree, and freeze it to use in the next few weeks. Just a thought that might save some space and energy! I usually can my pumpkin, not sure if it has less nutritional value than freezing or if home canned is ok for GAPS? By the away, if you do try canning Tattler lids are BPA free! I feel so blessed to have 8 pumpkins to process and lots of homegrown honey this week and it just happens to be the week that we are starting the intro! Love your story and your blog! It’s helping me make it through Day 1. Im not really sure, I’m sure the nutrients are the same because its already cooked. Is it canned in a can or jar? jar is ok, but metal is not great. yes i love those lids too. ohh honey mmm. thanks for reading I’m glad it helped! How do you can your pumpkin? I haven’t tried canning pumpkin yet because it is a low acid food so has to be done in a pressure canner. I just got one but so far have found no recipes or times for canning this product. The closest I’ve found is to can the pumpkin in chunks in liquid. Is that how you do it? I dont can it, it freeze it. I bet you could just google how to can pumpkin! This is what I found. http://www.pumpkinpatchesandmore.org/pumpkincanning.php looks like it is in chunks. GAPS seeds should be soaked, not just roasted. Yikes! I forgot to put the pumpkin puree in the freezer and it has started to ferment. Any uses for fermented pumpkin before I throw this away???? bet you could use it like regular pumpkin, but im not 100% sure. This is fantastic! I needed pumpkin puree for a pumpkin pancakes recipe and the step-by-step process you outline is so easy and, great tip on the pumpkin seeds. Husband loved them.